The cosmopolitan city of Shanghai is one of those bewitching places that casts a spell over the freshly minted Chinese tourist. 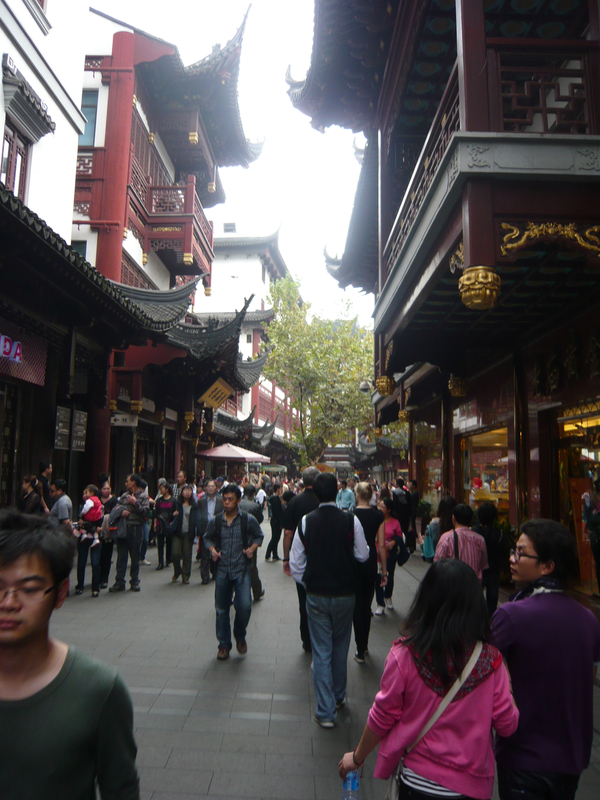 It is city that perfectly displays the contradictions and paradoxes of China itself. Like a jigsaw puzzle of mismatched pieces, Shanghai’s distinct and unique neighborhoods continue to fascinate and confuse the unexpected tourist who had initially thought they understood what China is all about. From the old-world European charm of the Bund to the ultra-modern over-the-top skyscrapers of Pudong, never has one city offered such extreme representations of old versus new. 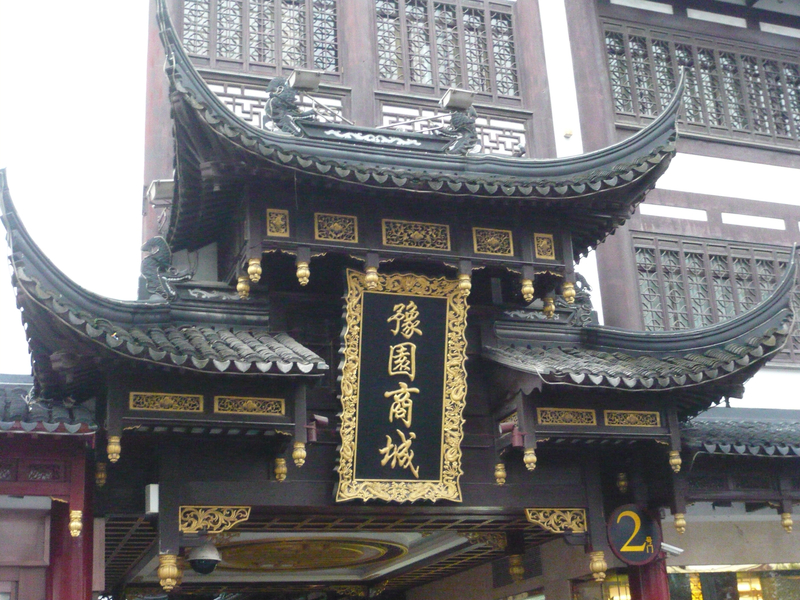 For one trip to Shanghai’s unique ‘hoods and the virgin tourist is proven wrong and thrown into even more confusion and fascination with the Middle Kingdom. 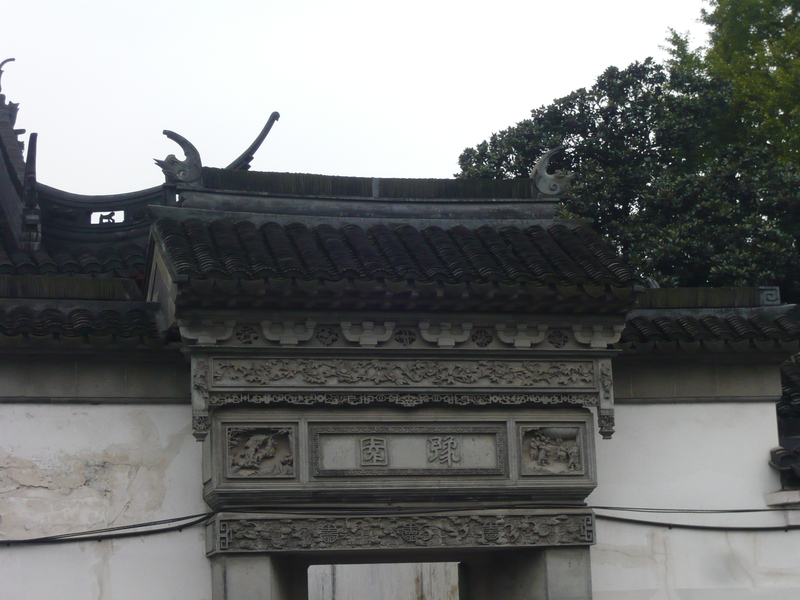 This next series of posts is going to continue on the journey through the unique and distinct ‘hoods of Shanghai. I’ve already written about the Bund and a little about Pudong at night. 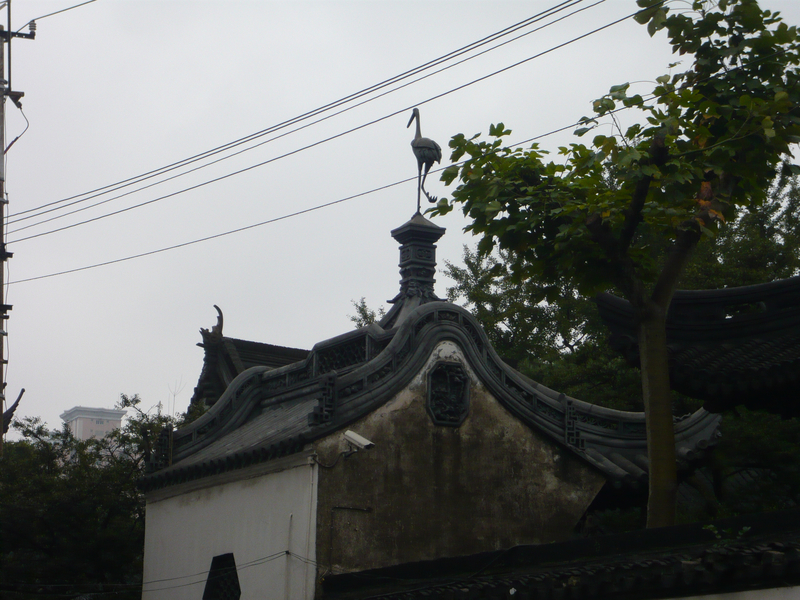 The next few posts will move on to some of Shanghai’s other noteworthy ‘hoods: Old Town, Pudong (during the day) and the French Concession. 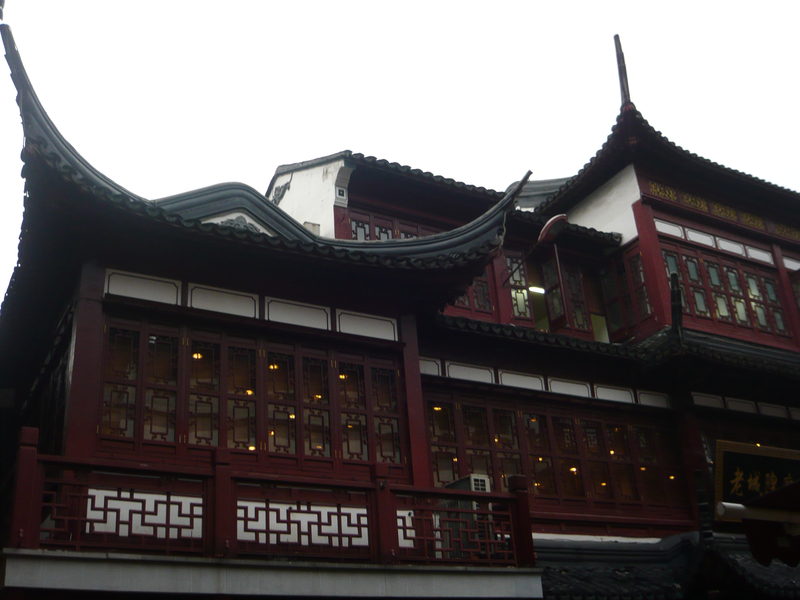 Old Town is perhaps the best representation of Old China found in Shanghai. Known to the locals as Nan Shi or “Southern City”, Old Town is a beautiful area of traditional Chinese buildings, bazaars, gardens, temples and shops. 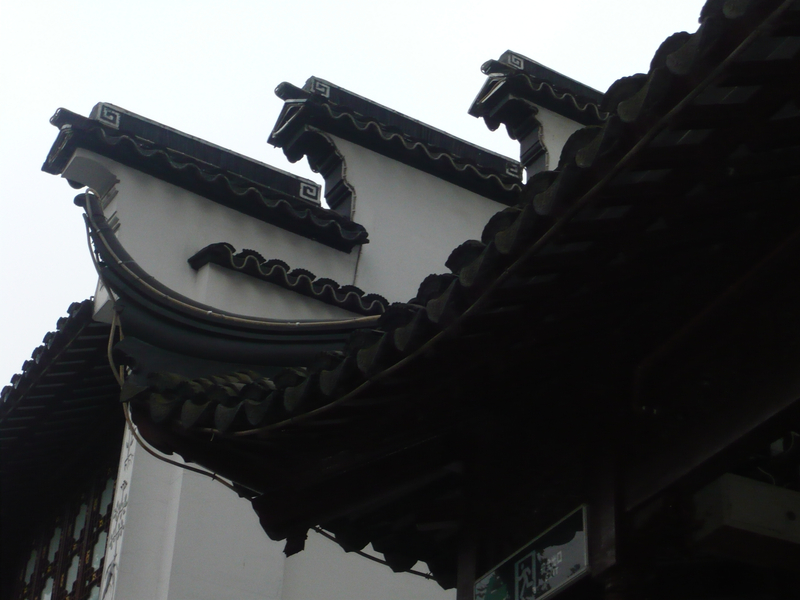 Although a large part of Old Town has been sadly bulldozed away to make room for modernization, there is still a large area remaining of these gorgeous traditional Chinese buildings, some of which date back to the 16th century. This part of town was originally built in a circular format protected by ancient, city walls to keep the malicious Japanese pirates away. Now, it has become a tourist mecca and unfortunately this once pristine area is now almost intolerable due to the swarms and swarms of camera-clod tourists. My dad and I actually stumbled upon Old Town one afternoon as the sun was setting and I was able to capture some pictures of it before the herds of tourists invaded. Here are some of my favorites. 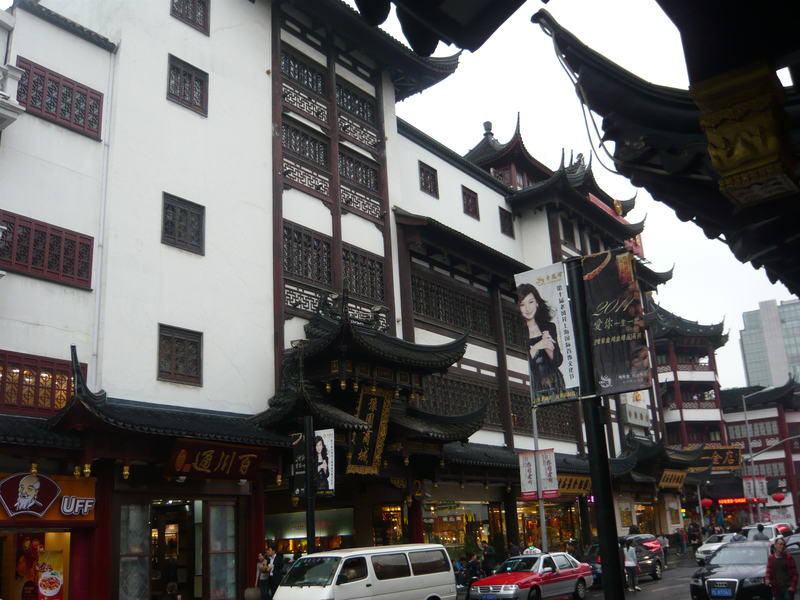 Old Town is only a few blocks away from the Bund, where we were staying. We had a map of the general vicinity and pretty much stumbled upon it by noticing a significant change in the architecture around us. Here is one such building that marks the opening of Old Town and its lovely buildings, shops and gardens. 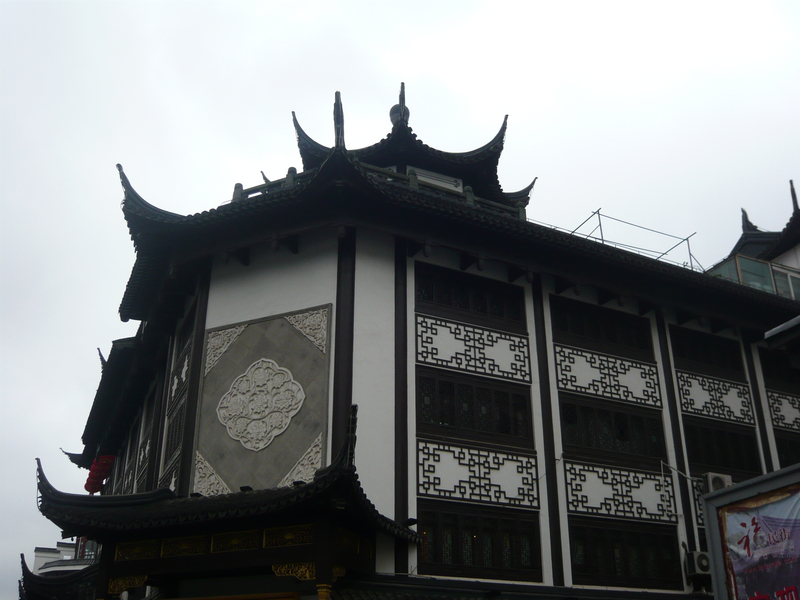 The buildings were unlike any I had seen in China. Nothing like the colorfully painted ones in Beijing that sprinkled throughout the city (especially in the Forbidden City). 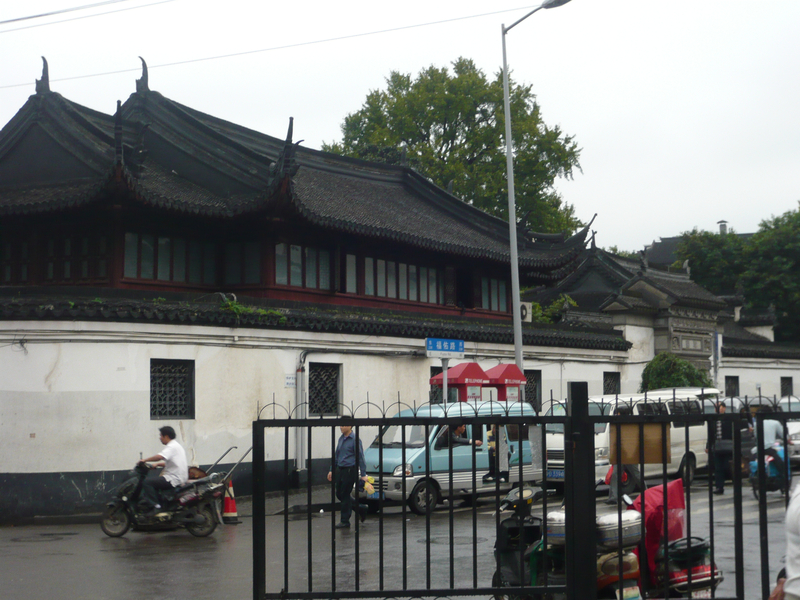 These buildings were mostly white with black lacquered woodwork across the rooftops. Before entering into the labyrinth of Old Town’s buildings through the pedestrian only passageways, we passed a preview of what was in store along the main drag. The whimsical black woodwork was indeed a lovely contrast against Pudong’s ultra modern skyline. We made a left turn into this bazaar and voila, we found Old Town! It was filled with every kind of touristy shop imaginable. Some were outrageously annoying stocked high with knickknacks and trinkets while others were quite nice (such as the department store where I bought a few silk scarves). As we wandered back inside, the narrow passageways did not allow for the swarms of people. It was late afternoon on our first visit to Old Town and a weekday. Thus thankfully it wasn’t that crowded…..yet. There were hundreds of gorgeously ornate buildings such as this one. I loved the juxtaposition of the red against the black and white woodwork. Simply spectacular. Unfortunately it was getting dark thus none of my next pictures turned out. It was a pity as we found a lot of serene ponds filled with goldfish, one of the Chinese people’s favorite luck charm. Hunger and thirst overpowered us (it was five o’clock, cocktail time!) so we decided to leave and come back the next morning. Although the weather was ok and not as smoggy, we forgot that Saturday meant a lot more people. Despite the crowds, at least the conditions were better for taking more pictures of the gorgeous buildings, a work of art in their own right. 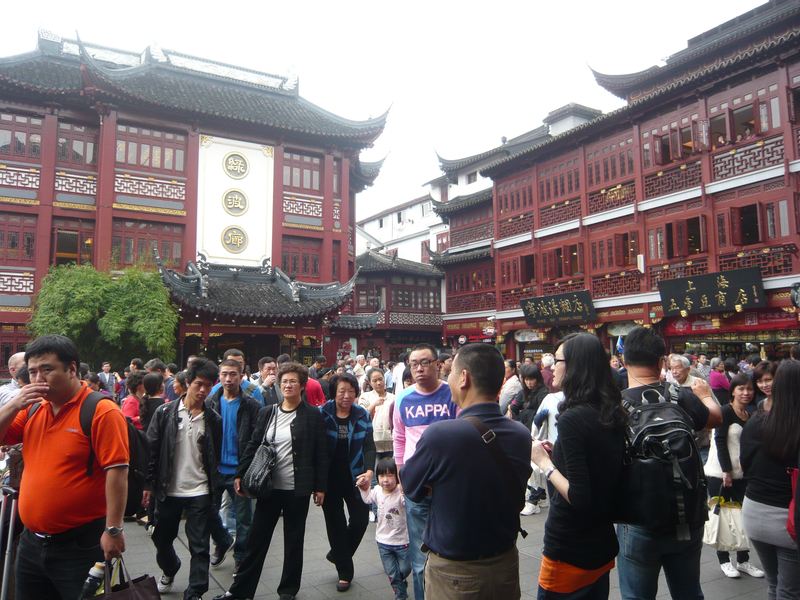 As we headed further into Old Town, the crowds of people became overpowering. Excuse me, excuse me….but I can’t even seem to move! As we walked out, I noticed two more buildings that were worthy of representing the “old”. The one in the photo above and below. And I learned a valuable lesson: Never go to a tourist attraction in China on a Saturday! 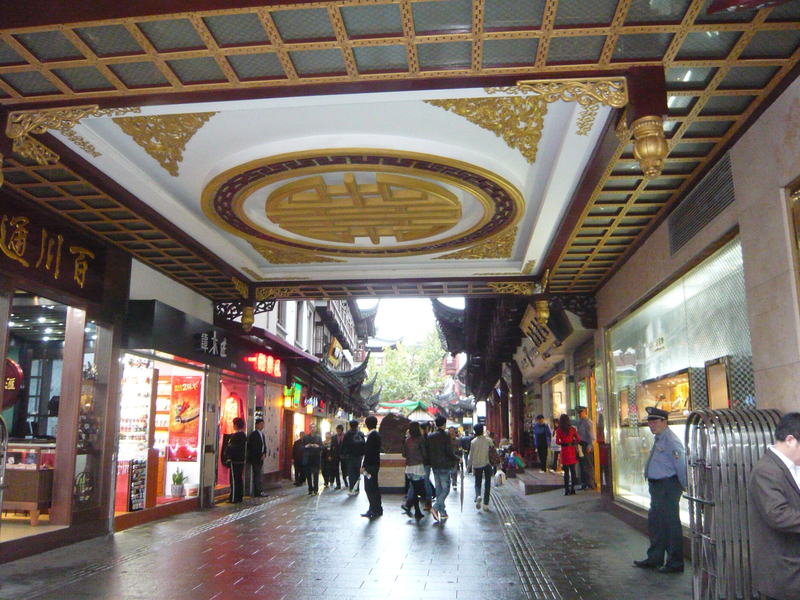 Stay tuned..next Shanghai ‘hood featured will be the glorious French Concession. 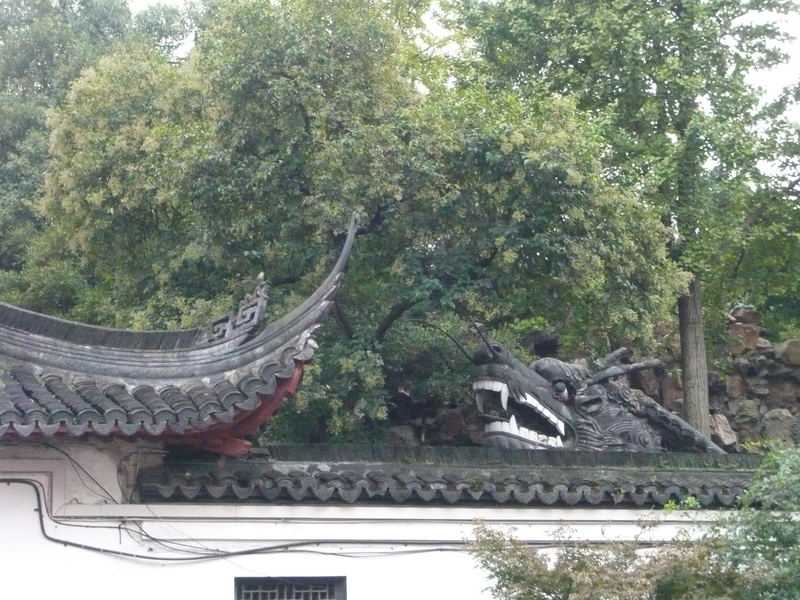 Reminds me an Hanoi neighborhood called the “Old Quarter.” Great photos, Nicole. Great Photos! The ornamentation on the buildings – beautiful. Thanks for sharing! Never go on a Saturday and don’t even dream of going in Chinese New Year where the crowds make everything horrible – except in Shenzhen because of its migrant status everybody goes home for the holiday and leaves the city to a half dozen expats for that period. 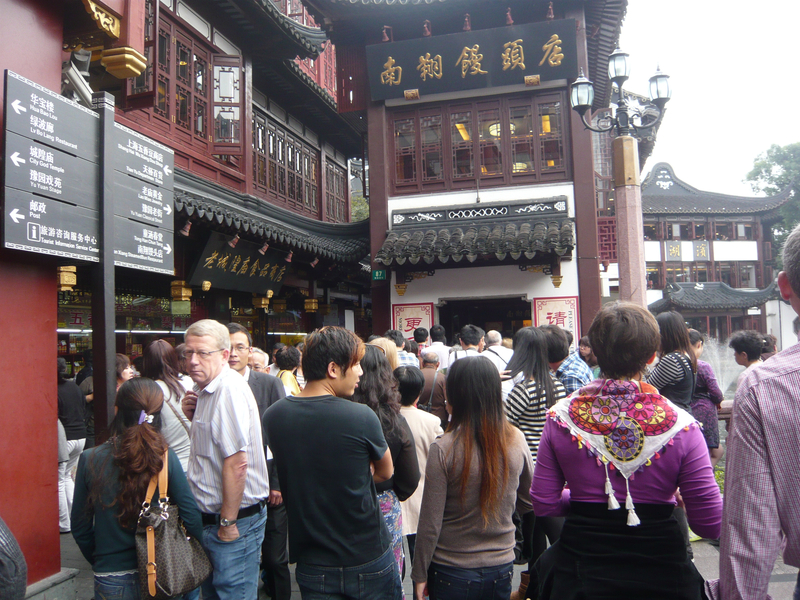 I get panicky in huge crowds too, it’s so uncomfortable – but the Chinese love it, the more people the better. Yes so true! 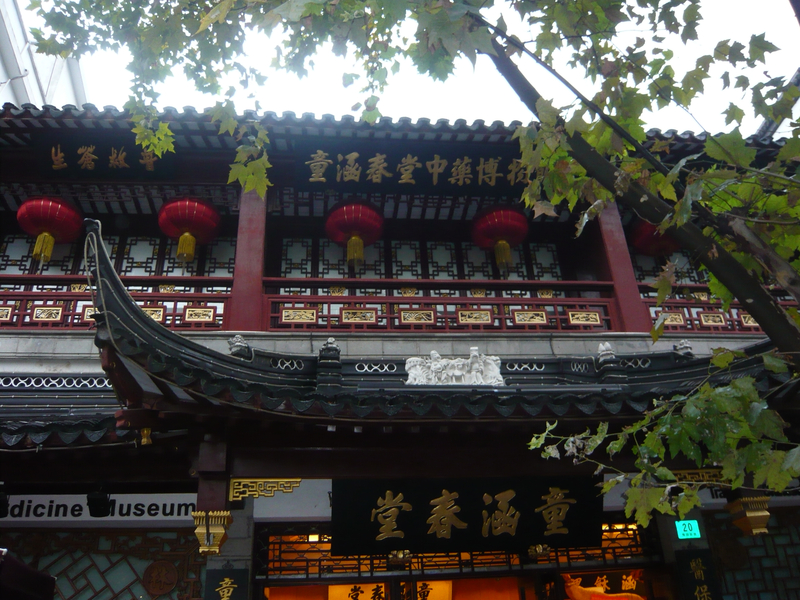 I especially love the Hutongs in Beijing. Those are my favorites!